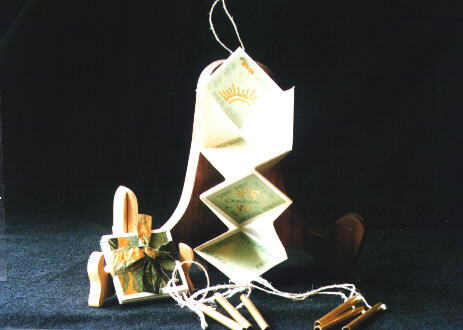 This 2" x 2" tiny Wind Chime Book is composed of a basic origami fold. The books used a variety of handmade papers. The verse was Gocco-printed on Fabriano Italia and pasted in place. The covers were decorated with various interesting papers - Thai tsunami, Florentine, Italia, Indian handmade paper. The chimes of brass tubing were attached to the book structure with hemp twine. Lettering is uncial. Sun face and floral motif were gilded on gum ammoniac base. Book 18" when open and hanging.